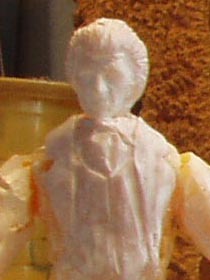 The Peter Cushing figure was made the same way as all my Doctor figures but for the face I took a cast of a Grand Moff Tarkin figure. 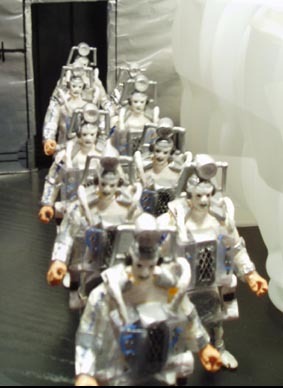 The Cybermen figures were made using the same mould as most of my other figures. The limbs have been covered in Clingfilm held in place by bands of paper covered in silver foil. In the absence of a Susan figure, Captain Scott needed to fill the companion role and couldn’t be an established figure in case she went on to be a regular Cushing companion. To that end I used my Blake’s 7 Mutoid figure. The crew of the freighter are all from Terrahawks to give them a uniform. They retain the names from the original story though two of them were originally women. The freighter used Guri's ship from Star Wars: Shadows of the Empire. The story was originally posted between November 2005 and January 2006 beginning with a teaser, at the time, heralding a return of the AFT after a short break. During that break, AFT readers were invited to vote for which Doctor they wanted to see in action next. The alternate movie version won. The superb movie poster was made by Luke Spillane. 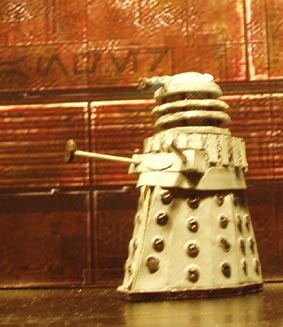 The original plan was to do an abbreviated version of The Daleks Masterplan. In the end pressure of time made The Dalek Masterplan unfeasible so alternatives were sought including other Dalek stories from the 60s and even a Troughton Cyberman comic strip before Earthshock was realised as the ideal choice. Since The Dalek Invasion of Earth had been heavily adapted for it’s big screen version I didn’t feel I had to stick too rigidly to the original story, especially since the early 80’s gloom of the original didn’t really fit the vibrant optimistic and naive 60s era I was hoping to recreate. 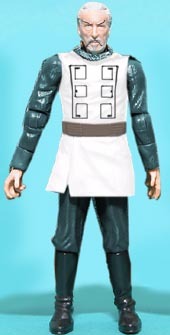 The use of the Mark 1 Cybermen and constant use of the moniker “Dr Who” is also intended to provide the 60s movie feel. Likewise the TARDIS' 'vworp vworp' sound has been replaced here by a simple hummmm. The dinosaur era Earth is a model- the ground is felt, with green foliage from a model shop. 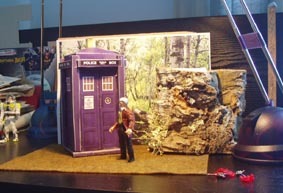 A block of tree cork is used as a background blending between the model shot and the Doctor figure with TARDIS. The TARDIS model was originally printed in the TARDIS technical manual. The coloured version appears on Iron Cow site. For this story, I added the St John's ambulance symbol. The walls of the cave are brown paper, scrunched into shape. The Cyberbomb is a model satellite. The freighter uses cardboard walls covered in tin foil with additional polystyrene elements and paper consoles. 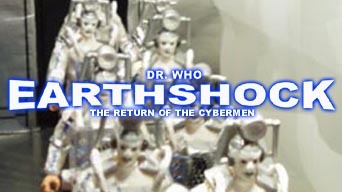 If you're not familiar with the original 1980's Earthshock I suggest you go and buy the DVD NOW or check out the episode guide at bbc.co.uk. The basic outline of the story is the same but some of the details have been changed. The teaser showing the Doctor in prehistoric times doesn't occur in the TV version. This was added partly to show the homing beacon being left behind but also to allow me to put in some 'movie' shots of dinosaurs. Dr Who is obviously well known in the galaxy, being invited to the anti cybermen conference. His TV version didn't even know about it. The Cyber androids looked nothing like Cybermen. In fact the Cybermen were kept a complete surprise until the end of part one. Captain Scott was a man in the original and the survivors of his team as well as Professor Kyle from the archaeology expedition accompany the Doctor and his friends in the TARDIS to the freighter. Captain Briggs was a woman as was her second in command Berger. Ringway, while working for the Cybermen had not been altered by them. The cargo being carried by the freighter was the Cybermen's army rather than explosives. The freighter ended up travelling back through time due to unstable plasma engines fused with Cyber technology. The story ended on a very sombre note as companion Adric met his death in the freighter's explosion at Earth. Shot but not used, the Daleks give chase. At the time, this was the first AFT story to use speech bubbles. A swift re-edit occured after the first preview was posted when one hawkeyed reader spotted the Jurassic Park symbol on the dinosaur. This was removed with photoshop. Edits made for the reposted version adds in a speech bubble that had previously been missing and removes a "to be continued" caption from the end of part two. The end of the story was left deliberately open to allow for a continuation of this alternate Doctor series. I decided to cut out a final frame that would have shown the TARDIS being tracked by Daleks as at the end of The Space Museum/ beginning of The Chase. As a movie version, this story has no continuity links with the TV series. In movie continuity, it's probably set after the two Dalek films.